I have a diy mask recipe to share with you girls (or guys) out there that can help to brighten your complexion without drying out your skin. I have been using this mask ever since high school and always loving it. The best part is that it only requires two ingredients which can be easily found in your kitchen cabinet! So the things that you need for this mask is turmeric powder and whipping cream. Turmeric is very popular and often used by the Indian brides the night before their wedding to help brighten and glow their skin for the wedding day. Not only that, it can also help in reducing redness, inflammation and acne on your skin overtime. Whipping cream, on the other hand, is packed in AHA acids which is a great element in moisturizing and hydrating your skin. It also acts as a gentle chemical exfoliant to exfoliate dead skin cells, revealing healthy and glowy skin. The acid will help in whitening your skin as well. So what are you waiting for? Let's do it! So you want to mix your mask into a consistency like this. Not too runny or too clumpy. It should turn into a smooth paste. After that, I just leave the mask to set for about 3-5 minutes so that the two ingredients can react together. In the mean time, you can prepare your skin by washing or steaming your face to get rid of excess oil and dirt so that the mask can absorb better into your skin. I would recommend putting on a shirt that you don't mind getting stained on because may I warn you, this can STAIN. And then you can just apply the mask on and play the waiting game, lol. Go read a book, play games or something as the mask is drying, which usually took around 8-10 minutes. If you don't want to stain your hands, you can apply the mask using an old makeup brush, or just use the back of a spoon that you used to mix the mask like I do. The back of the spoon makes a great applicator as it gives a cooling effect which I enjoy. 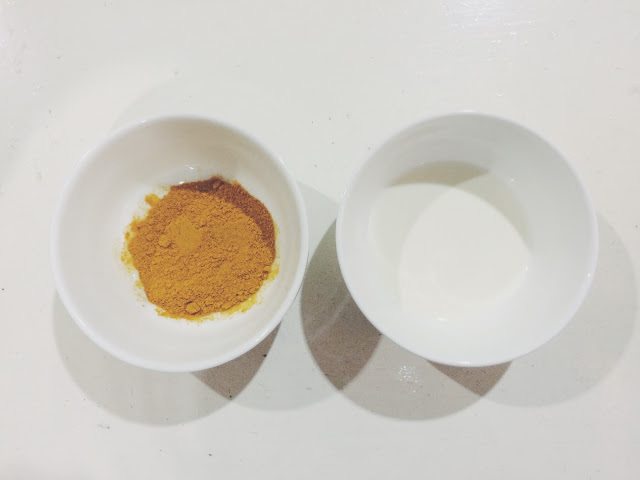 After 10 minutes, just wash your face with lukewarm water, making circular motion to get rid of the mask as the turmeric powder can work as a gentle exfoliator too. Don't be afraid if you notice that your face turned into an Oompa Loompa after washing, lol! Simply wipe off the stain with toner and cotton pad and you're good to go. And that's it! Very easy right?